Welcome to our Trivia page! The X80300 option, on the Service Parts decal, is the GVW identity. Like most "options", the last 3 digits change by year, i.e., 1975s are X80500, 1978s are X80800. Sometimes the options show as 801, or 802. In later 1973, when the GVW went to 11,200, they changed to X80400. GMC Motor Home: This is the product name designating a vehicle completed totally by GMC, including the interior. These were purpose-built to include kitchen and bath facilities in a self-contained coach. Units completed by another manufacturer or upfitter, such as Coachmen or Navion, did not go by this product name, but would go by the name listed below or the one mentioned above. GMC Transmode: This is the product name designating a vehicle whose chassis and body were produced in the GMC plant but delivered to another upfitter who completed the coach. For instance, some were completed as people movers and used by Hertz to transport customers from airport terminals to rental car lots. Some units were sold to government agencies and used as mobile labs. Still others were delivered and finished out with interiors for use as motor homes. In other words, a Transmode could have seen service as a motor home or as a special purpose vehicle without living facilities installed. 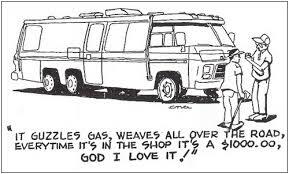 If the motor home was furnished with a GMC interior, the label in the glovebox identifies the interior finish model, except for '73 & '74 models. While we don't know how many Transmodes Elegant Coach upfitted, there is only one listed in the GMC Registry. What is interesting about the Elegant approach was the interior layout and choice of materials. For example, there was a toilet, but no shower. There was a huge entertainment center making a focal point, a leather-look ceiling, a hot plate instead of a stove and a wet bar, double facing couches in tan leather and lots of interior lighting controlled by a panel on the wall. The most noticeable exterior feature was the raised, brass wings about 2' wide with a red ball in the center. The body was painted an off white with a red stripe. The following were at the Las Vegas Transmode announcement. Only the Eleganza SE saw limited production). Bill Bryant has provided photos with captions of various changes to production that are of interest. For example, the door latch. The scanned images seen here are from pages of various brochures. Bill has assembled and grouped these making comparison relatively easy. which were the interior decor schemes and available in four of six available exterior colors. were Pineapple Yellow 527, Parrot Green 577, Bittersweet 575, and Sky Blue 554.